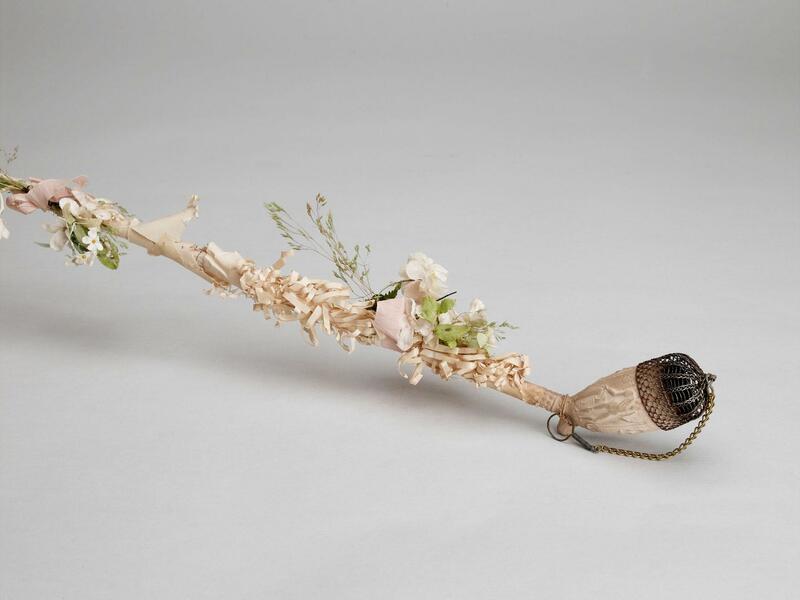 A groom’s clay pipe, decorated with paper flowers. First half of the eighteenth century. Courtesy of the Frisian Maritime Museum. A couple of weeks ago, when I was in the final stages of researching a paper on an entirely different topic, a call in the early nineteenth-century proceedings of the Dutch society for husbandry (Nederlandse Huishoudelijke Maatschappij) caught my eye. The society, established in the late eighteenth century as a branch of the Royal Dutch Society of Sciences and Humanities (Koninklijke Hollandsche Maatschappij van Wetenschappen), started a new program to improve the applied sciences and artisanal industry in the Netherlands, such as engraving, painting and pottery manufacture, through prize competitions and the establishment of art academies. This call was for a prize competition: who could produce the best paper flowers? Judging by advertisements in newspapers and magazines, making paper flowers was a popular pastime and they were widely used as decorative items, so it made sense to want to stimulate their production. Art supplies seller’s advertisement for paper to make paper flowers. Rotterdamse Courant, 3 December 1816. Source: Delpher. Click to enlarge. “But what on earth does this have to do with science and medicine?” I hear you think. Well, a quick search learns that paper flowers did play a role in both science and medicine – although at wildly different moments and locations. A contemporary origami kusudama. Courtesy of roserevolution. 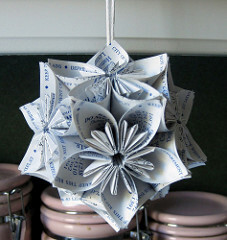 A kusudama, or Japanese medicine ball (kusuri means medicine and tama means ball) is a kind of origami paper flower that is nowadays made as a decoration, but they probably stem from the Heaian Period (794 – 1192). Originally it was a bundle of fragrant woods and herbs placed in a small cloth bag, which was decorated with blossoms and hung in the house to dispel evil spirits and disease. Unfortunately I have been unable to find reliable sources on how and when the medicine ball transformed from a cloth bag into a paper flower, and when the medicinal use disappeared. Maybe there is a Japanese reader out there who can enlighten us? 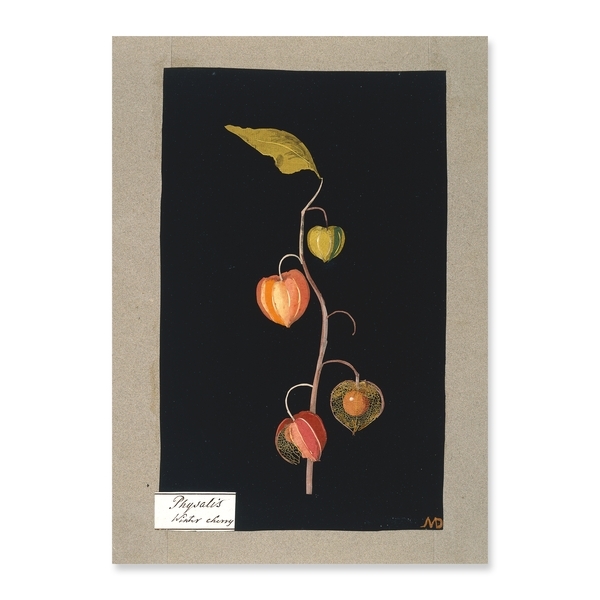 Mary Delany, Physalis, Winter Cherry, a paper collage. Courtesy of the British Museum. An entirely different kind of paper flowers are Mary Delany’s (1700-1788). An upper class lady who grew bored with other pastimes after the death of her husband, Delany started making vividly coloured representations of blossoming flowers out of tissue paper in her early seventies. This may sound as a rather eccentric hobby, but in the royal and intellectual circles in which she moved, her models were taken extremely serious: the botanist Sir Joseph Banks allegedly declared that her collages were ‘the only imitations of nature that he had ever seen from which he could venture to describe botanically any plant without the least fear of committing an error’. This seems to imply that, although not exactly three-dimensional, Delany’s models did have a certain depth and detail that was lacking in drawings and prints. Moreover, their advantage compared to dried flowers must have been that they did not loose colour over time, and had not shrunken, although Delany occasionally included parts of the actual plant in her collages. In the collage in the image above, of the Winter Cherry, an actual skeleton of a pod case is stuck over paper seeds. A century before Leopold and Rudolf Blaschka started making their famous glass flowers, Mary Delany’s paper flowers were the state of the art in botanical models.